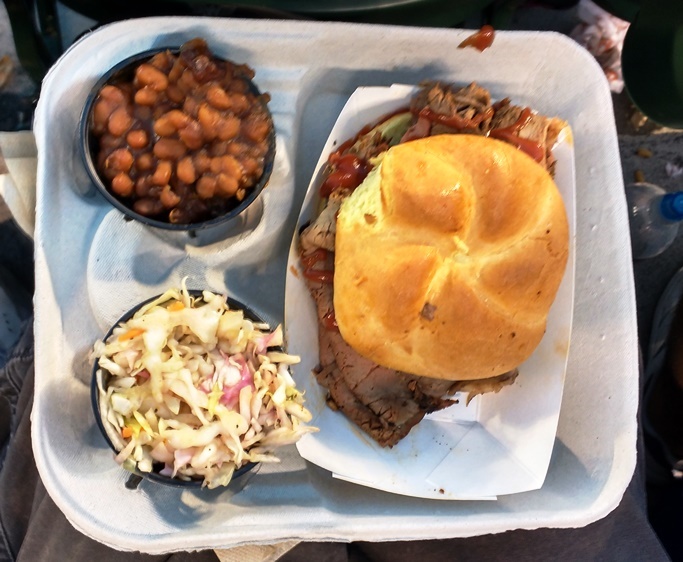 When first-timers visit Oriole Park at Camden Yards, they’re almost universally told to “try Boog’s BBQ.” The smoke wafting from the tent on Eutaw Street has been a feature of Camden Yards since its opening in 1992. Long lines form at Boog’s BBQ stand, especially on high attendance nights. 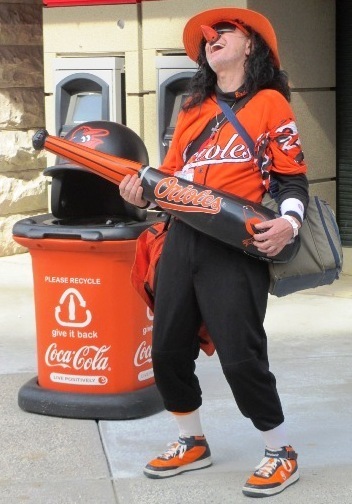 Fans get their picture taken with the large first baseman from the Orioles’ salad days, order a sandwich or platter of pit beef or turkey, enhance it at an impressive condiments stand, and either sit at a Eutaw Street picnic table to eat or watch batting practice. Not hard to see why it’s so popular. The pit beef is recommended most by online reviewers, but the turkey sandwich is pretty good too, and the platters with slaw and beans offer decent value; you likely won’t be hungry afterward. One Orioles employee suggested to me to bring your own bread and get your sandwich “naked” to get more meat on your plate. Worth the effort. Oh, and the condiment stand there is banging…take advantage. Try to get to Boog’s BBQ early, if you don’t want to miss any of the game. True Birds fans know that Rick Dempsey was good enough to have beer named after him. Dempsey’s, named for the popular O’s catcher and 1983 World Series MVP Rick Dempsey, is a restaurant built into the warehouse. 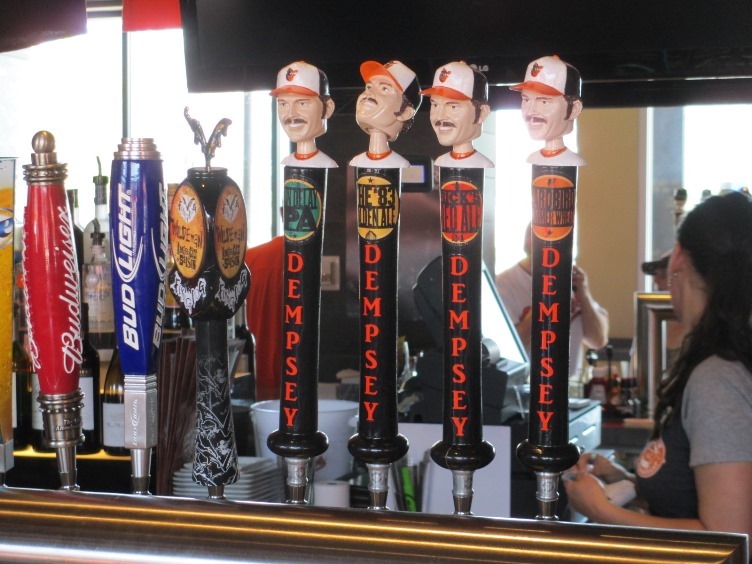 It features brick walls, O’s memorabilia, and beer taps with craft brews like Rain Delay IPA (click here to see why Dempsey is associated with rain delays). The menu is pub-style and includes appetizers like crab cakes and rock fish tacos, and the main menu is mostly burgers and sandwiches, like the Dempsey Club. There’s also the “Walk-Off”: a Roma sausage in a pretzel roll with Old Bay crab dip. Save some money and appetite for that one. If you want to try Dempsey’s and not miss any of the game, you have to get to the Eutaw Street entrance as soon as the gates open. You might want to avoid Dempsey’s on giveaway nights when most fans arrive early. Long lines form very quickly, and you could be waiting a long while…enough to miss some live baseball. Prices aren’t terribly bad for a ballpark restaurant, and Dempsey’s is open on non-game days. Don’t miss Rick’s poetic dedication to Memorial Stadium inside. OK I give, where’s the mustard? Elsewhere on Eutaw are a few of the unique food stands at Camden Yards. There’s the Bud & Burgers and Stuggy’s Gourmet Hot Dogs at the north end, where you can order unusual burgers and dogs (the crab mac and cheese dog is very popular) in case a simple hot dog doesn’t wow you. There’s also a Eutaw Street Market in the warehouse where you can find some grab and go items, and at the south end of Eutaw is a new Eutaw Street Gyro Grill. You may lament the disappearance of the “other” BBQ stand, but the gyros and spinach pies are pretty good. Besides, Boog’s BBQ is plenty BBQ enough. 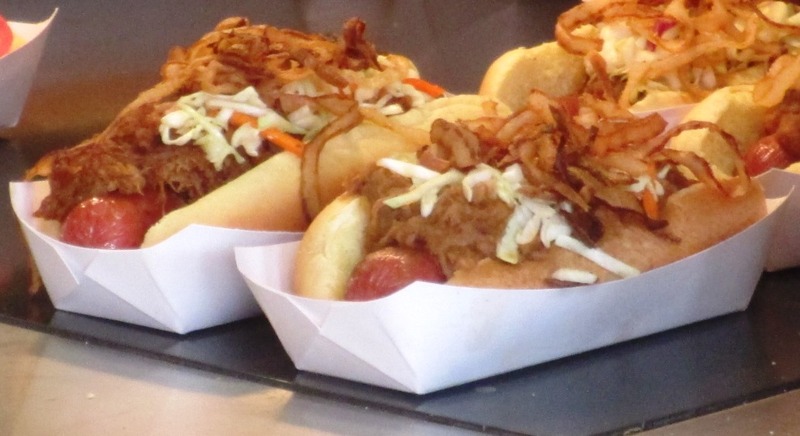 That’s just scratching the surface of the Camden Yards menu, however; not only are there some great selections around the concourse for fans looking for crab stuff, but you can get decent grub outside of the ballpark too.